Another good English at the The Village Inn in Westward Ho! and an early-ish start of 9:30am. A cloudy start with rain promised later in the morning, unfortunately the forecast didn’t let us down. The first part of the walk is quite open and the views even though it was overcast were still beautiful. When it did start raining we gained some protection from woods, the woods were part of the walk pretty much from just about 6 miles into the walk. This reminded us very much of the early days of the walk back at Minehead. The flat walking was now gone and we were back into the undulating ’normal’ coast path. We took a coffee break in the drizzle at Bucks Mills before the final 4 ½ mile push into Clovelly. Arriving in Clovelly the rain started just as we were sat out side a tea room partaking in a cream tea, this didn’t stop us enjoying the moment as we also watched some gig racing going us down on the sea. We did seem to do this section really fast, this told on us later falling asleep when we got into the B&B and also later in the evening, yes our legs where tired. Internet connectivity in the B&B wasn’t as good as I’d have liked hence the lack of links in this section, I’m likely to add them at a later date. 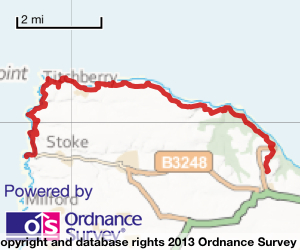 11.3 miles Distance, including extra walks to beaches and to the ends of any points we visited.